You can stop searching now. Interested in your own Click & Collect app? mmmLUNCH is a Click and Collect app for your lunch to go business. Your customers can place orders through the iOS and Android apps. You'll also get a webpage which you can use to promote your new Click & Collect App. We've packed in lots of great features but made sure that mmmLUNCH remains really easy for you to use. Your customer arrives to collect their lunch at the allotted time, happy to get exactly what they want without having to wait in a queue! Sounds Perfect - Sign Me Up! Use the quieter times to make lunchtime orders. 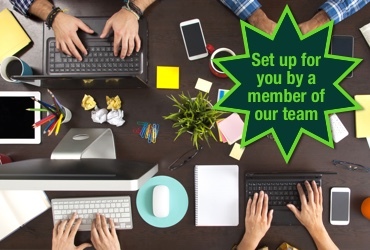 This allows you to serve more customers without needing to take on extra staff. No more customers being put off by long queues during the busy lunch hour and walking away. 1990 called. It wants it's fax machine back. mmmLUNCH helps you finally ditch the fax machine and stop being a slave to the phone. With the mmmLUNCH Click & Collect app you receive a simple, clear list of orders at the time you specify - no more answering phones or collating faxes. 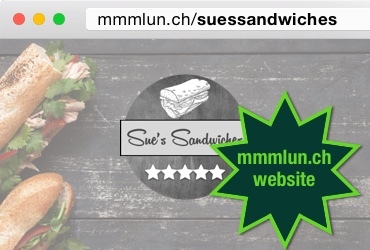 mmmLUNCH is based in the cloud and accessed via an internet browser (computer, smartphone, tablet...). We send you notifications by SMS and email to let you know that you have orders available. There's no special till or EPOS equipment - if you can access the internet you've already fulfilled all the technological requirements needed for mmmLUNCH! It's 2017. You shouldn't have to deal with cash anymore. All orders you receive through mmmLUNCH are already fully paid for. Customers pay in the mmmLUNCH app when they place their order using the latest payment technologies. There's no extra charges - we cover the payment processing fees. Serving a customer who has ordered through the Click & Collect app is really easy. They simply show you their receipt on the app which contains a special code which matches the code we provide you when you receive the order. As they've already paid the whole process takes only seconds. Technology moves fast! Here at mmmLUNCH we help ensure that your lunch to go business doesn't get left behind. We support the latest tech; whether it's payment technologies like Apple Pay... or the latest marketing practices like Bluetooth Beacons. They're all part of the service with mmmLUNCH. We're constantly adding new features to make sure that your lunch to go business doesn't get left behind. The app is really simple for your customers to use and can also be branded with your logo! Don't worry if you don't have a logo - we'll work with you to set something up. ...and we keep adding more! We include an automatic loyalty scheme which you can use. Customers collect points for each 10p spent. You set how generously you reward your customer loyalty. We include a Bluetooth Beacon in your Marketing Pack to add even more value to your lunch to go business. This provides timely notifications to potential customers who come in range of the beacon! We provide a simple way for you to make announcements to your customers through the app. Perhaps you've got a new filling to announce... or perhaps you've just released your winter menu. With the mmmLUNCH app you have a line of communication directly to your customers. Customers can send you direct, private messages with any feedback or questions they have. mmmLUNCH supports meal deals, allowing customers to quickly and easily upgrade their lunch to a meal deal. With mmmLUNCH we include labels which you can use to mark up the orders once they are made - hand-written or printed on a standard home/office printer. We also support printing to some models of Brother or Dymo label printers. We also include a stock control facility which allows you to limit orders containing a particular ingredient if you have a limited supply of that item. mmmLUNCH fully supports display of the 14 allergens described in the EU Food Information for Consumers regulation. You've seen some of the amazing features that are included with mmmLUNCH. You also get access to all the new features as we make mmmLUNCH even better! 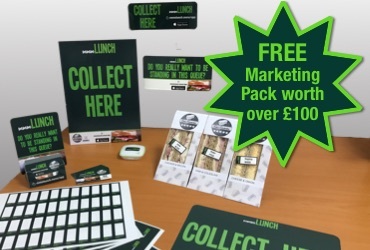 We include a FREE Marketing Pack of your choosing worth over £100 to help launch your new Click & Collect app. There really is no risk to give mmmLUNCH a try! In the unlikely event you receive no orders - it won't cost you a penny. 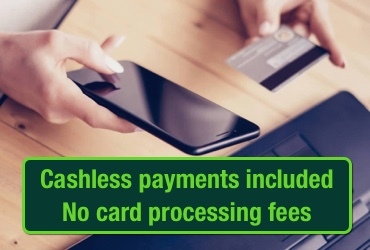 We cover all of the card processing fees allowing you to accept the latest payment methods with no effort. We'll assign you an Account Manager that will handle all of the set up of your mmmLUNCH Click & Collect app. 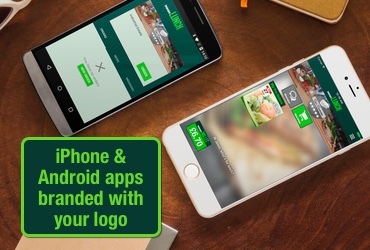 You'll be able to accept orders through the mmmLUNCH iPhone and Android mobile apps, complete with your own logo branding. You'll be given an mmmlun.ch address which you can use to promote your new Click & Collect App and showcase your menu online. We send your proceeds on a weekly basis, on the day of your choice direct to your bank account by Faster Payment. The payment comprises of the sales proceeds of all orders collected since your last payment less the mmmLUNCH fee of 5% + VAT. You can request an ad-hoc payment outside this schedule for a small charge of 40p. I'm not very confident with technology, can I still use mmmLUNCH? Don't worry! We're here to help. We handle all of the set up for you. If you're reading this website, then you've pretty much mastered all the skills needed to use mmmLUNCH! We'll be there to help with any questions you have. I already have a Loyalty Scheme. Do I have to use the mmmLOYALTY scheme? Not if you don't want to, it's optional. We think you'll love it though! We'll also help transfer your customers onto the mmmLOYALTY scheme without them losing their current points. Can I transfer my customers to the mmmLOYALTY scheme? 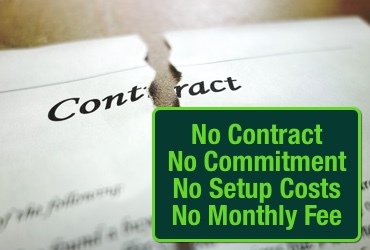 You sure can - we'll help you through this to make sure your customers don't lose out. If you've got any other questions please don't hesitate to contact us. We've produced a FREE 6 part email series titled Increasing Your Lunch To Go Revenue where we run through some of the key things you should be covering to achieve this aim. We take your privacy very seriously and will never share or sell your email address to any third parties. We're here if you've got any questions about how mmmLUNCH works. Where will you be using mmmLUNCH? 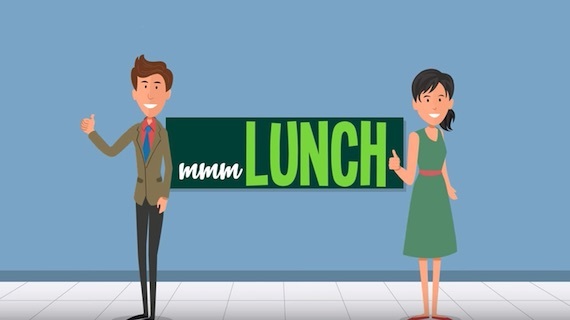 How did you hear about mmmLUNCH? Looking to increase your lunch to go sales? We've created a FREE 6 day email course to provide you with actionable steps you can take to help get more business.